The DM115 Peavey's Dark Matter 115 powered speaker super sound quality and reliability. The Peavey Dark Matter DM115 powered speaker makes a perfect setup for gigging musician on the go. Peavey has always looked out for the working musician, manufacturing tools of the trade that perform at a professional level without emptying your bank account. Forty years after the introduction of the iconic SP-1 loudspeaker, Peavey has done it again with the Dark Matter enclosures. 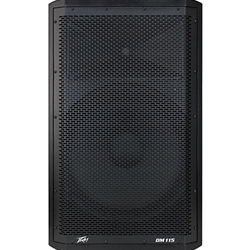 The DM115 Powered Speaker is a powered full-range enclosure designed for live sound applications appropriate to bands, DJs, installations and other sound reinforcement challenges. Thanks to its new advanced DSP-equipped power section, the DM115 Powered Speaker brings unprecedented performance and efficiency to the powered speaker category. These high-SPL (Sound Pressure Level) enclosures feature modern styling, high output and portability to your PA system. Fan cooled for maximum reliability, the DM 115 Powered Speaker features Peavey's exclusive Quadratic Throat Waveguide technology that helps deliver pristine, precise sound.